As you know, our Monetary Composite move to its most bullish stance of M1 last week. So, what makes monetary liquidity so plentiful that it pushes our composite to this level? Fed FEARS!! We've seen the GDP numbers, and they are not anything to get too excited about, but that is not the crux. The CRUX is housing. For the last two years, the banks have been forced to take a slow approach to cleaning up their foreclosures. But that is coming to an end. This is the year when the increased pace of bank-owned foreclosures hit the market. This is a very strange economic recovery, because as you can see in the chart below (provided by Calculated Risk), in every modern-day recession, the Fed used housing to catapult the economy out of recession. 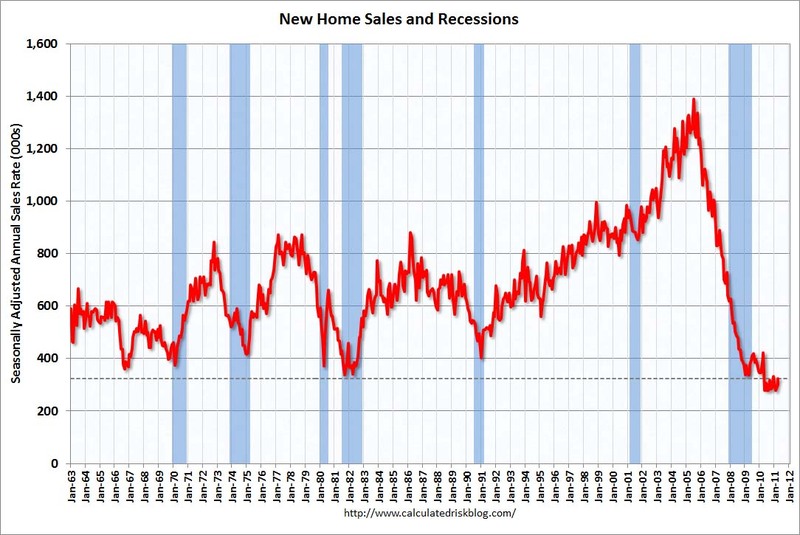 Instead of leading, however, in the current situation, you see that new home sales have continued at record lows. And at the same time, you are seeing and hearing (this morning) of expected further declines in housing prices. Also, it is likely that the recent lower low made by the relative strength of the bank stocks is due to the big inventory of foreclosed homes that the banks will have to unload over the next few years. And this year is the beginning of that process. So, you can take it to the bank that monetary liquidity is going to stay very flush, interest rates are going to stay low and housing prices will find a floor here. To read today's full Market Comment, click here.